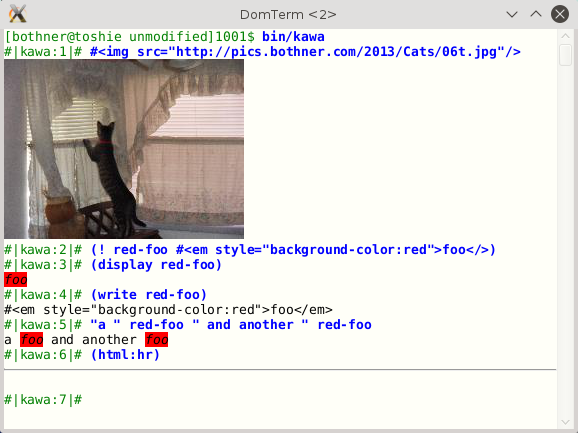 DomTerm is an terminal emulator based on web technologies. Beyond solid xterm compatibility, it supports powerful features for REPL (read-eval-print-loop) consoles: Application output can have images, rich text, and links, with structure-based line-breaking (pretty-printing), and folding. There is also input editing; automatic paging; screen multiplexing (panes and tabs); and session management (like tmux or GNU screen). This OpenSource.com article provides an overview of the functionality. This old LWN article provides background, motivation, and a summary of the functionality. The name “DomTerm” refers to how it works by manipulating the Document Object Model (DOM) of a browser: the nested structure of elements, text, and attributes. 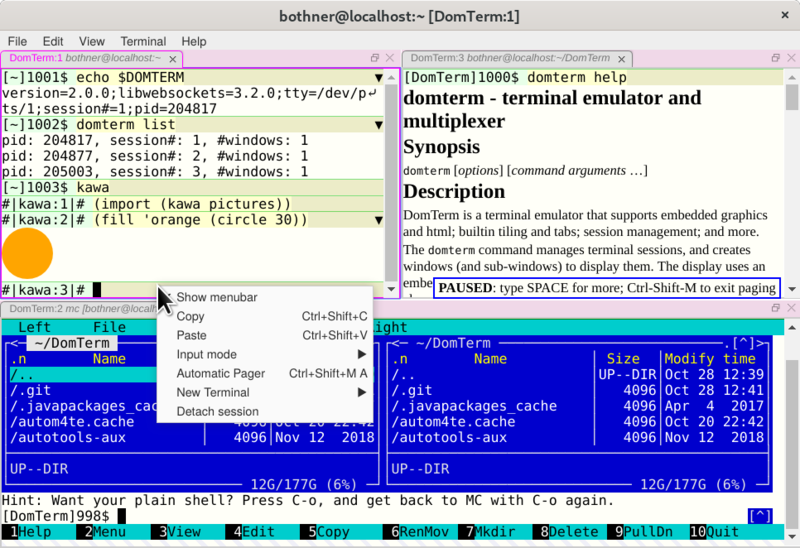 DomTerm is Free Software (open-source) available at https://github.com/PerBothner/DomTerm. There is a mailing list at <domterm-discuss@domterm.org> with an information page and archives. Sixel graphics is now supported. The domterm command takes multiple sub-commands, similar to how tmux or git. The command automatically starts server if not already running. Session management, with detachable sessions, as in tmux or GNU screen. An experimental package atom-domterm for the Atom editor is available. A front-end based on Electron is now the preferred one. We now support draggable tabs and panes. An experimental pager with optional automatic pause on each page. The preferred “backend‘ is now libwebsockets. This is light-weight, does not require Java, is actively maintained, and enables serving http and the WebSockets on the same port. Support for CJK (Chinese, Japanese, and Korean) characters is improved: Double-width characters now really are two columns wide.